Even though this book came out four years ago, I nevertheless found it interesting, appealing, and contemporary. Because they don't use "now" colors, any color scheme will do, so you're not tying yourself down. The idea of allowing in more light is great, especially when living in an apartment where there are no big windows. I found the idea of draping diaphanous and sheer fabrics, in some cases instead of traditional curtains, very novel. I like how they can soften a room. Particularly interesting was how well room dividers work, and, I would imagine, are easy to do up. Like ones found at yard sales. The book also features a "how-to" section. There are projects for sewing novices like me, where in a most instances, there's very little stitching. Lots of good ideas to liven up your home. 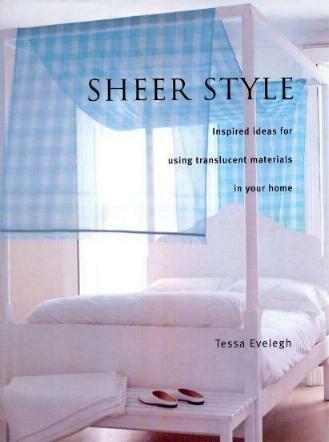 SHEER STYLE may be purchased and/or ordered through your local bookstore. Conclusion - Superb gift for someone who loves changing their decor.